“Okey dokey smokey…” that’s the start of one of the BIGGEST tags I’ve ever been involved in. 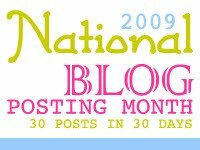 One of my fave bloggers whom I recently began following :::the.kisser:::, has challenged me to blog EVERY day for a month in honor of National Blog Posting Month. As I have been trying to light a fire under my muse…this might turn out to be a hefty, but worth while challenge to oblige. She’s chosen a theme…but, because I know I may have a touch of ADHD…I think I’m gonna go random. Blogging whatever comes to mind and heart. I’m such an absent-minded professor, that to show my dedication, I’m going to put a recurring alarm in my phone to keep me abreast of my bloggerbilities (blogger responsibilities) LOL. I think my girl Butterfly Effect would like to put it down for the month as well!